Barack Obama has never lacked for ambition as president. On policy, he aims to be as transformative as Ronald Reagan. Culturally, he knew that his family’s presence in the White House would offer a potent symbol to a nation accustomed to white hands on the levers of power and white children frolicking on the South Lawn. As the president’s second term in office winds down, the world is now used to seeing touching images of the Obamas walking the dogs, playing in the snow, riding bikes or tending to the vegetable garden. They are the type of first family activities relentlessly chronicled when the White House was occupied by young families named Bush, Clinton, Carter or Kennedy. But these pictures offer not just a look at the nation’s current first family, but also something more unusual: an opportunity for all Americans to share intimate glimpses of a high-powered black family. In a nation of stubbornly segregated neighborhoods and social networks, and a still-expanding black middle class, that portrait is simultaneously rare and increasingly common. For many Americans, families like the Obamas are all but unseen outside of television or the movies. But for lots of African-Americans, the Obamas are familiar, and they offer validation of their own experience, making them a source of deep pride. Obama often eschews symbolic racial gestures, preferring to deal in the tangible. 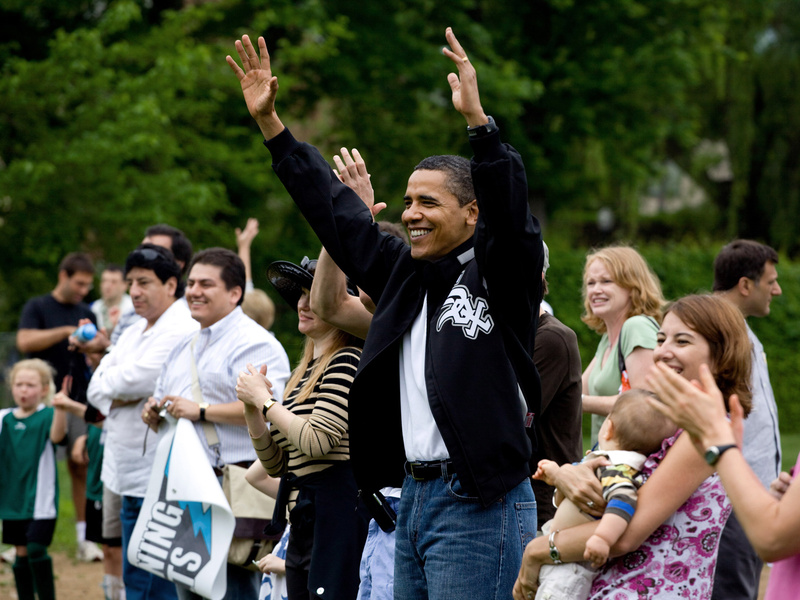 Yet, from the start he understood transformative power of the presence of a black family in the White House. After being occupied by the Obamas for nearly eight years, it is easy to forget the White House’s racial history — which is every bit as tortured as the nation’s. The building was constructed largely by black men, some slaves and some free. Also, while blacks have long worked in “the people’s house,” with rare exception they were not welcome as guests until modern times. The first black people believed to have been overnight guests at the White House were entertainer Sammy Davis Jr. and his wife, Altovise, who were invited by President Richard Nixon in 1973. That history helps explain why the Obamas’ example is especially cherished by African-Americans. 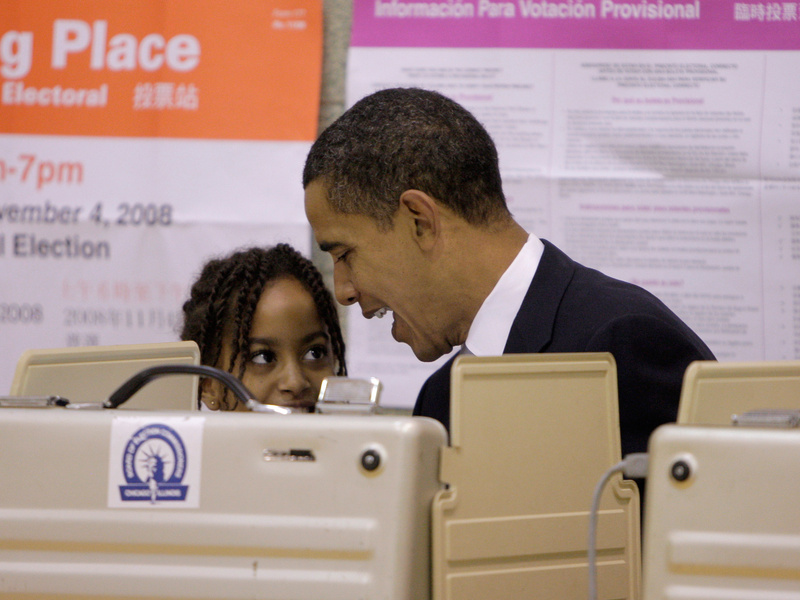 It is also true that for many black families, the Obama family model is increasingly rare. The majority of traditional black families survived slavery and Jim Crow, but they are struggling to navigate contemporary economic realities and evolving social norms. The ravages of higher unemployment and incarceration rates, lower educational levels and greater poverty are apparent in the structure of many black families. Overall, some 71 percent of black children are born to unwed mothers, about double the rate that existed in 1970. By comparison, 29 percent of white children are born to unmarried mothers, up about four-fold since 1970. And while black and white marriage rates were roughly comparable as recently as 1950, African-Americans are now the racial group least likely to marry or to stay married. 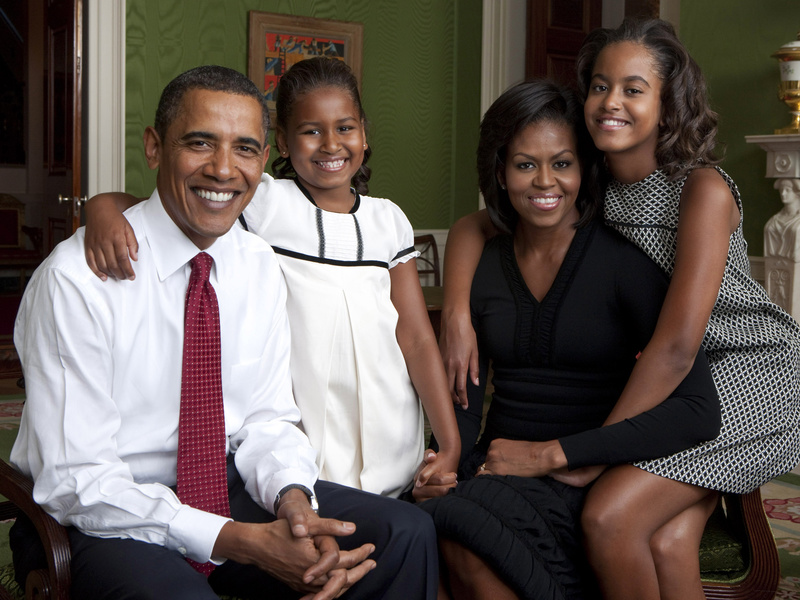 Given that backdrop, many black family scholars believe the Obamas represent an ideal of black family life. “The president is a model. His family is a model,” said Dr. Alvin Poussaint, the renowned psychologist who was a consultant on The Cosby Show, the 1980s sitcom about the Huxtables, a fictional upper-middle-class black family. 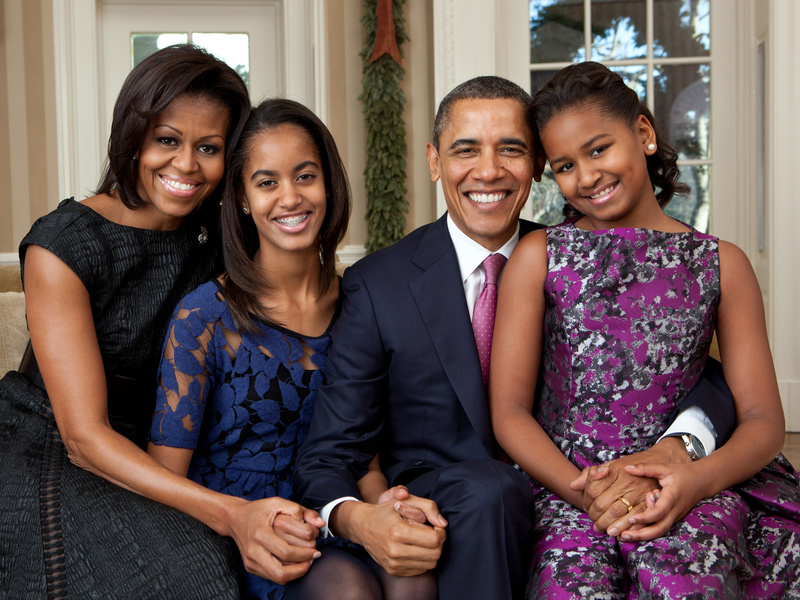 Unlike the Huxtables, the Obamas are real, and Poussaint believes they make a difference in people’s lives. “They put the two-parent family much more on the map. I believe the Obamas will go down as one of the stronger images of family that occupied the White House, period,” he said. Even as they are widely admired, the first couple have been candid about their own struggles with the pressures of marriage and parental responsibility. More than once, Michelle Obama has said the demands of her husband’s political career have taken him out of the daily decision-making that comes with parenthood. It is a complaint she aired, and her husband acknowledged, long before they rose to prominence and moved into the White House. 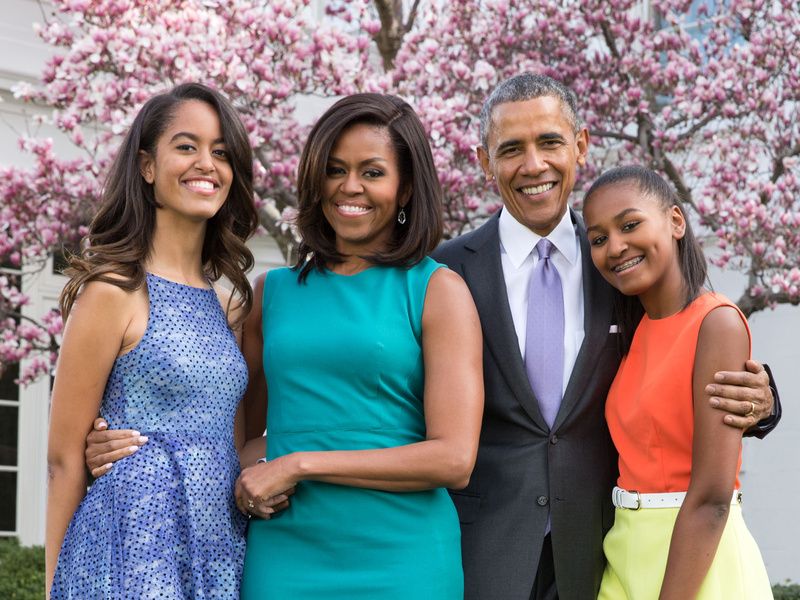 Now, his work is so consuming that the first lady has said that she sometimes feels like a single mother to daughters Malia, 18, and Sasha, 15. 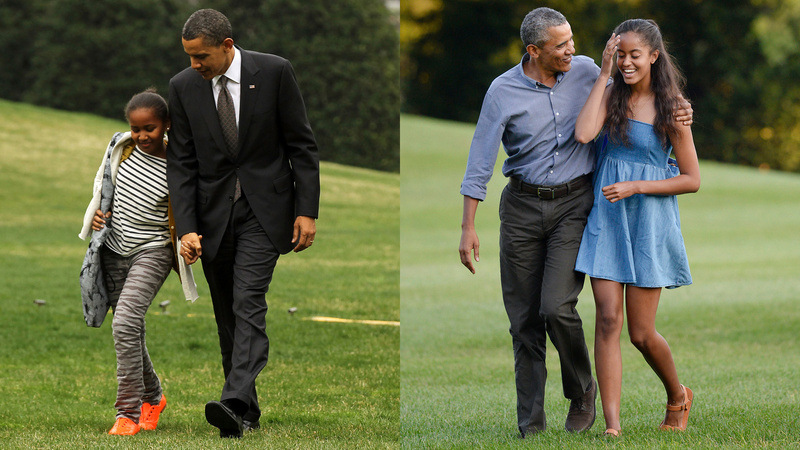 President Obama with Sasha in 2011 (L) and Malia in 2015. Then there is the warmth — or is that heat? — that radiates from the first couple’s own relationship. Even though we know that public appearances by public officials can be scripted, their connection feels real. Back in 2009, the new president greeted the crowd at an inaugural ball saying, “First of all, how good-looking is my wife?” Later, Beyoncé serenaded the Obamas with the Etta James classic “At Last,” and they danced closely, whispering to one another. Their 24th anniversary is approaching on October 3, and the camera still catches them gazing into one another’s eyes. 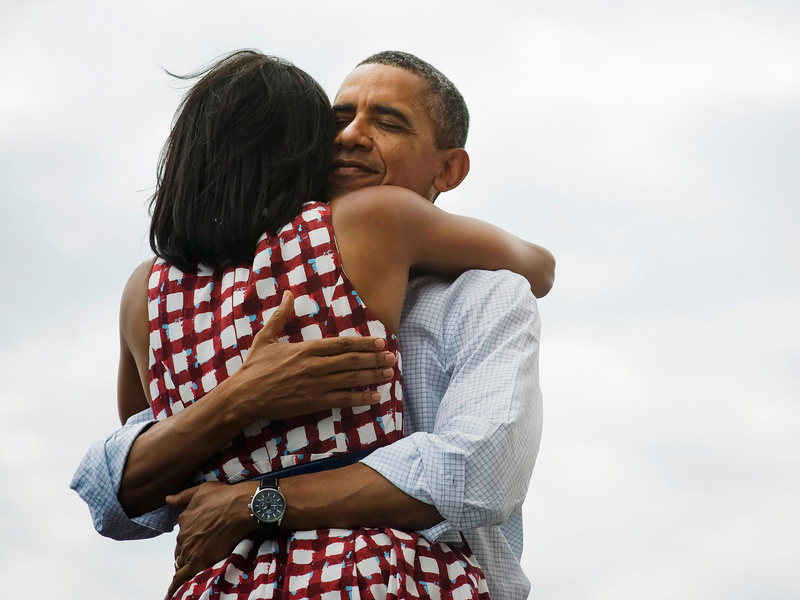 When Obama’s re-election was called by the networks in November 2012, his campaign staff tweeted a picture taken earlier that day of the first couple in a tight embrace. 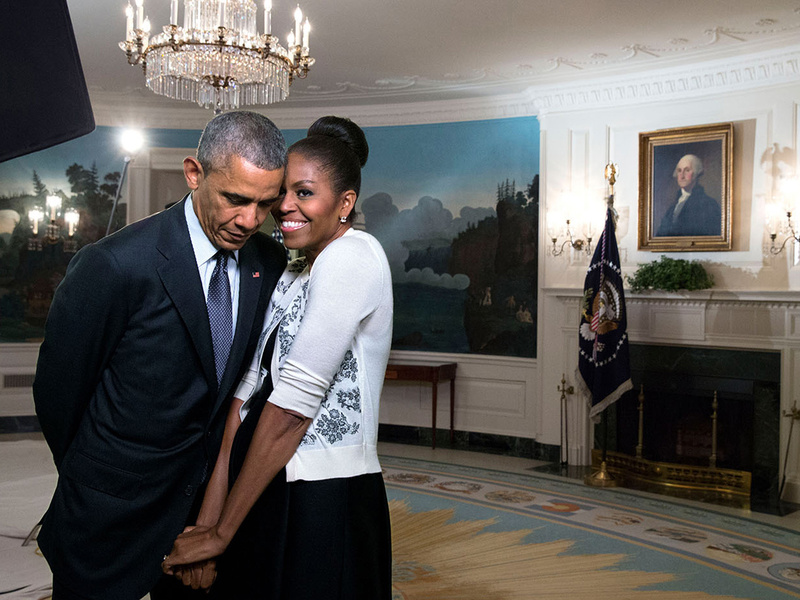 Michelle Obama’s back was to the camera as she hugged her husband around the neck; the president’s eyes were closed as he held his wife. The public loved the photo. Within minutes, it became the most retweeted photograph in Twitter history, and even now it still has a place in Twitter’s top 10. Even the first couple’s first kiss has been immortalized. Obama described it in his second memoir, The Audacity of Hope. It was re-enacted in a new movie about his and Michelle’s first date in 1989. And it is frozen in bronze and granite on a marker not far from their Chicago home. “On this site, President Barack Obama first kissed Michelle Obama,” reads the plaque located near a former ice cream shop in Hyde Park. It features a picture of the couple locking lips, and goes on to quote the president from a 2007 interview with O, The Oprah Magazine. “On our first date, I treated her to the finest ice cream Baskin-Robbins has to offer, our dinner table doubling as the curb. I kissed her, and it tasted like chocolate,” the plaque reads. It is a poetic recollection and coming from many other politicians it might seem a touch too lyrical to be real. But who can doubt its authenticity after watching the first couple and their daughters live their lives under the unblinking gaze that comes with the presidency over the past eight years? 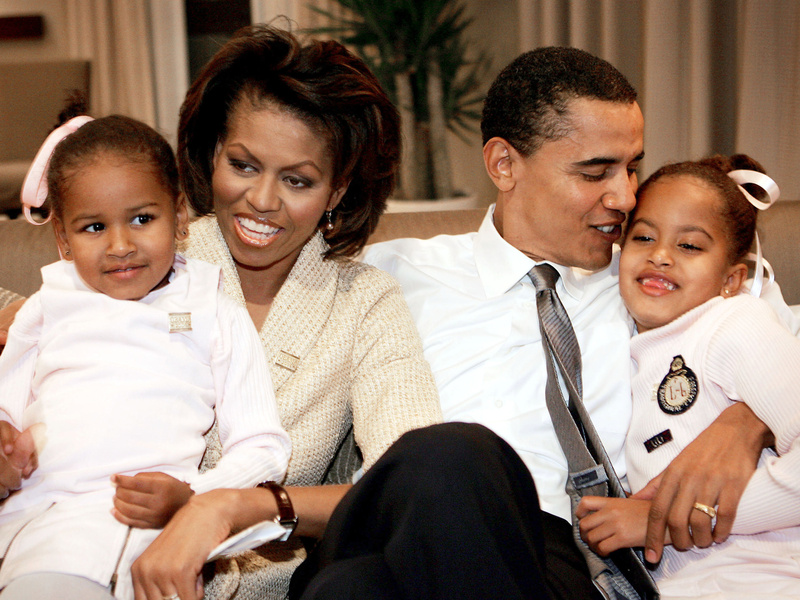 Obama has said that his family time, the ordinary moments that live on in memory, is crucial to helping him withstand the extraordinary pressures of his job. For lots of African-Americans, the Obamas are familiar, and they offer validation of their own experience, making them a source of deep pride. Cassandra Chaney, a Louisiana State University professor who does research on the black family, said the images the public sees of the Obamas looking one another in the eye, teasing one another, or fist-bumping to celebrate a success, makes them seem not only ideal, but also down to earth. 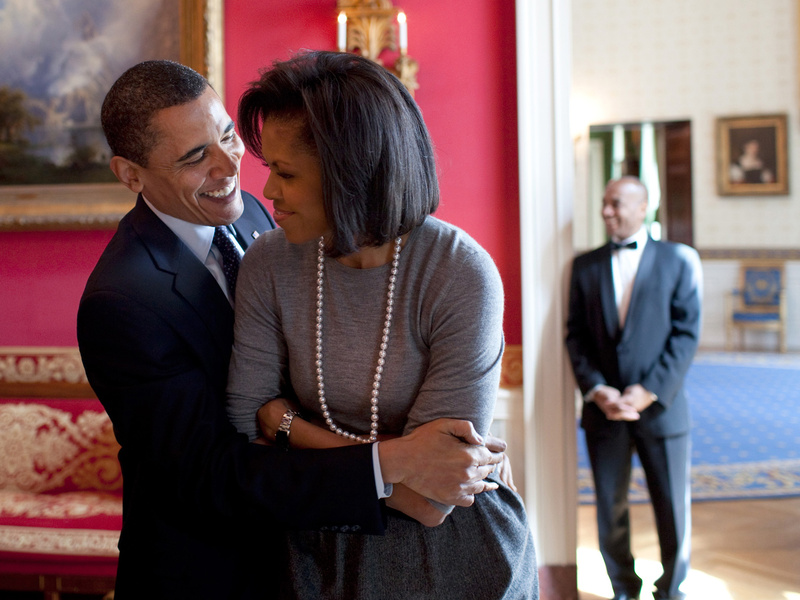 Chaney co-authored a 2013 study that examined whether the Obama family — whom the authors called “the strongest and most visible example of black love and happy marriage in the USA” — would inspire more black marriages. Their conclusion: not necessarily. One reason is that increasingly, successful marriages are most common among people who are college educated and relatively affluent, regardless of race. 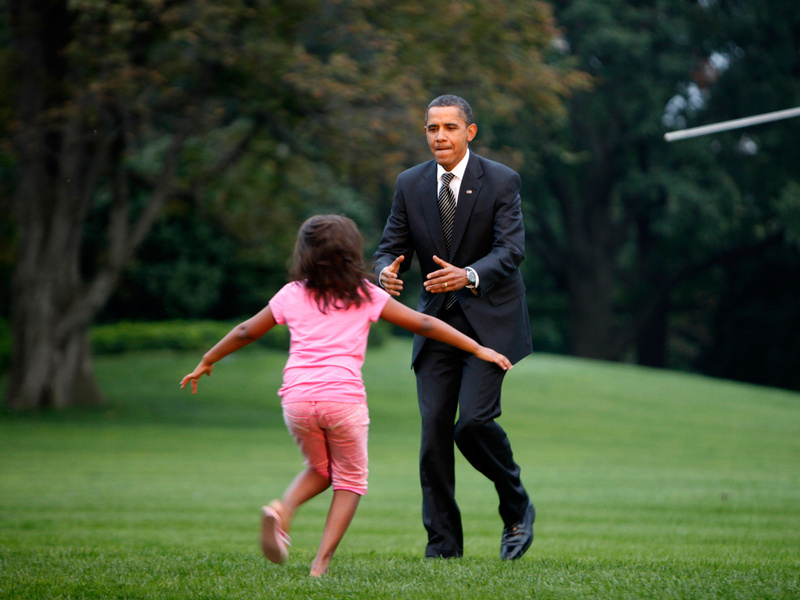 Still, Obama has made it clear that he thinks no obstacle — neither poverty, nor the responsibilities of the presidency — should stand in the way of being a responsible parent. Speaking to a group of students in Washington, he explained why.